Fortnite visit Showtime venue looks set to be one of the latest Marshmello challenges. The first Fortnite Showtime challenge - search Showtime poster - went live yesterday with more set to drop today. And thanks to leaks we already know what the next Fortnite Showtime challenges should be. 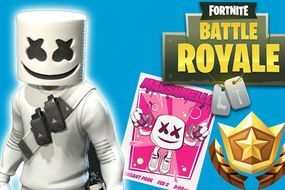 Dataminers have said the remaining Fortnite Marshmello challenges include visit Showtime venue and keep it mello at a trucker’s oasis, ice cream parlour and a frozen lake. The final leaked challenge is dance on a truck stop sign, on top of the new Durrr Burger restaurant and on a concert stage. But in the meantime here’s how to solve the Fortnite visit Showtime venue challenge. online YouTuber Gattu explained how to solve the Fortnite visit Showtime venue challenge. Fortnite players will simply need to head to Pleasant Park which is where the Marshmello concert is taking place.